AP — Seiko Epson, said it has developed the world’s largest organic electro-luminescence display, which produces clear images while requiring little power. “The company has developed an original inkjet process for depositing organic layers on large-size (thin film transistor) substrates,” Seiko Epson Corp. said in a statement. “Using this technology, Epson has now developed the world’s largest, 40-inch diagonal, full-color (organic electro-luminescence) display prototype,” the company said. 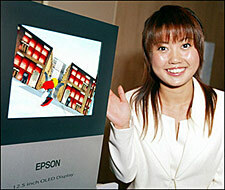 Seiko Epson plans to start selling products using the technology in 2007. Organic electro-luminescence displays uses organic layers to illuminate themselves and consume less power than liquid crystal displays. The displays offer high contrasts, wide viewing angles and fast response times — characteristics required for the next-generation lightweight displays, the company said.